SAN FRANCISCO, CA -- (MARKET WIRE) -- October 13, 2006 -- As winter rolls upon us, San Francisco's ultimate day spa, Tru, picks up the heat inside their revolutionary Tropical Rainforest Room. The new treatment, "Crimson Slide," mixes two of natures best known anti-oxidants -- pomegranates and cranberries -- creating a one-hour treatment of pure pampering. The ingredients say it all! The pomegranate, one of the world's single best sources of anti-oxidants, effectively scavenges free radicals to keep skin healthy and young. Similarly, cranberries are anti-bacterial and have a high amount of Omega 3 and 6 to keep skin supple and smooth. The berries are also supercharged with a form of Vitamin E, which improves the skin's moisture retention. For 60 minutes, "Crimson Slide" successfully renews the skin with hydration and anti-oxidants. "Crimson Slide" -- Fight against the ravages of winter's harshest elements without bundling up. The scents and richness of the cranberries and pomegranates wait to slather onto your entire body. A hearty body scrub and rich mask are applied during the 60-minute treatment which will have you feeling cozy and warm. Couple that with a few minutes in the hot steam and you will feel the cranberries and pomegranate restoring and revitalizing your skin. The signature Tropical Rainforest Room area is a personal retreat to a place far from everyday life. Tru, an independently owned and operated modern day spa located in downtown San Francisco, offers facials, massage, nail services, waxing, microdermabrasion, skin peels, scrubs, and custom water treatments. There are eleven treatment rooms; five of which will have computer controlled "colorblast" lighting to combine colored light therapy with massage. 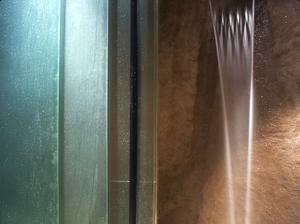 Every detail of Tru is designed to reinvigorate and to provide a unique atmosphere for the spa experience. Tru is conveniently located at 750 Kearny (at Washington), San Francisco, inside the new Hilton Financial District Hotel. For additional information about Tru and all spa treatments, visit www.TruSpa.com or for reservations call (415) 399 - 9700. Experience Tru's newest winter treatment, 'Crimson Slide,'<br>inside the spa's Tropical Rainforest Room.